The Canadians have done it! I’ve seen the seed-based business cards and other brochures that are environmentally friendly. However, the new trendy, eco-savvy approach is to go beyond simple cards. Botantical Paperworks, based out of Winnipeg, Manitoba, took a whimsical approach to beautiful, handmade stationary that gets your greeting cards out of those dusty memory boxes and back into nature. The plantable paper (called Garden Greetings™) is "tree-free", meaning that no trees were cut down in the process to make the plantable paper. The base fiber is cotton or 100% post-consumer waste. And the paper is made with pure North American wildflower seeds by skilled papermakers paid a living wage in Winnipeg. The botanical adventure extends to confetti, envelopes, calendars, journals and even baby and wedding gifts. 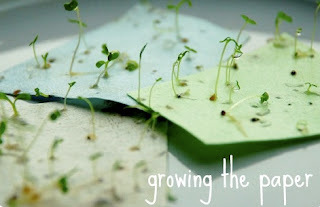 A Sustaino idea with a great green twist! You're very welcome! I've been researching different paper-based gifts and was impressed with your sites positioning and offering. Keep up the good work!